A view from above through the roof of the Madam Zingara building from a neigbouring property. On Tuesday, about 20 homeless people - mostly immigrants from the DRC - who were living in the disused former Ivory Room and Madame Zingara buildings on Loop Street, Cape Town, were kicked out by the Central City Improvement District (CCID) without a court order. 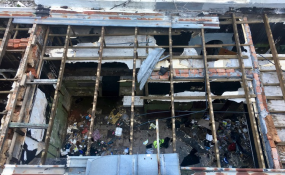 The CCID and Councillor Dave Bryant of Ward 115 said that the building owner was complying with orders from the City's Problem Buildings Unit to secure the premises. But an attorney from the Socio-Economic Rights Institute of South Africa (SERI) said that it is illegal to evict people occupying a space without following the necessary legal proceedings, including obtaining a court order to remove those occupants. Several of the occupants said they had been living in the building for years. Muneeb Hendricks, Manager of Safety and Security at the CCID, said it had received a call from the owner that his property had been broken into by people unknown to him. "CCID, along with City of Cape Town law enforcement officers as well as SAPS responded, as forced entry into a property is housebreaking, which is a schedule 1 offence," said Hendricks. But no arrests for housebreaking were made. "The Problem Buildings Unit has been working with the property owner who has a pending building plan," said Bryant. He said it was not an eviction because it was the property owner entering his own building and the building had been occupied illegally. The Western government defines a "problem building" as any building or portion of a building that appears to have been abandoned by the owner with or without the consequence that rates or other service charges are not being paid; that is derelict in appearance, overcrowded or is showing signs of becoming unhealthy, unsanitary, unsightly or objectionable; that is the subject of written complaints in respect of criminal activities, including drug dealings and prostitution. But Khuselwa Dyantyi, an attorney at SERI, said the CCID's actions were unlawful. The Prevention of Illegal Eviction (PIE) Act protects those unlawful occupants, she said. "There is no other way he can remove these people without a court order." "[The owner] has to apply to get an eviction order and then the court has to look and see if the occupants can afford alternative housing, and if they can't, the City of Cape Town is obliged to find them other housing," Dyantyi said. Hendricks said surrounding property owners alleged criminal activities and "the CCID can confirm that numerous reports of robbery, drug dealing and usage, illegal fires and intimidation have been filed." But Dyantyi said in such a case due process would still have to be followed. According to Councillor Bryant, the occupants once again entered the building on Tuesday night and blocked the entrance from the inside with bricks. Copyright © 2017 GroundUp. All rights reserved. Distributed by AllAfrica Global Media (allAfrica.com). To contact the copyright holder directly for corrections — or for permission to republish or make other authorized use of this material, click here.